Knowing how to hit a fade shot consistently and reliably will add to your game’s armory and help you to improve your scores. For the first few weeks, months, or possibly even years of your golf career your primary focus is just going to be making contact with the ball. Eventually, when you get to a place where your shots wind up somewhere in the air, the focus then becomes a little more precise. There are a lot of reasons to learn how to control your shot shape, and while there are a few options for how to do exactly that, today we will be going over how to hit a fade shot. Read on for a guide on how to hit the most consistent shot in golf. Good question. You do have options when it comes to your shot shape – mostly between the neutral, or straight path, the draw, and the fade. Each have their merits, but the fade has a long-standing reputation for accuracy. Why? The fade shot enjoys a higher trajectory with more backspin than the draw. That means that it is able to hold its line better, and it will also roll out more consistently on the fairway and green. Of course, that doesn’t mean that the left to right ball flight (for right-handers) is immune to its misses. You are probably well aware of how punishing a slice can be. In fact, if you are new to the game there is a good chance that that is your typical miss. Let’s take a look at how you can harness a swing defect into a shot that will change the way that you play the game. Incorporating a gentle fade into your swing is actually easier than you would probably guess. Let’s take a look at a few simple steps you can take to harness a shot that will help you find more fairways. The first thing you can do to promote a fade is also probably the simplest. To open your stance simply aim a little bit to the left of where you want your shot to ultimately end up. This accomplishes a downswing that promotes the cutting across motion that is necessary for right to left spin to occur. It will also ensure that your shot is properly aligned. As you play with your shot shape you may at first experience a little bit of trouble figuring out where to aim. 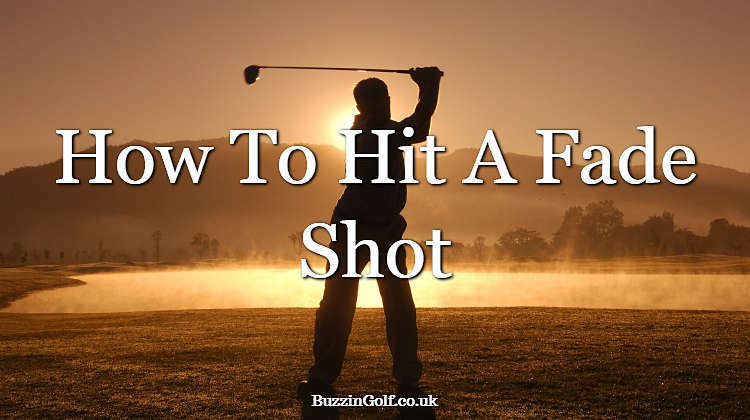 You will need to get in the habit of aiming left enough to land your shot close to your target if your fade does occur but not so left that you will wind up in trouble if you hit a straight shot. Keeping the ball up in your stance will accomplish a few things. First, it will help you get some of the height that contributes to the accuracy of the fade. It also helps to further promote the cutting downswing that we discussed earlier that will help you start moving the ball left to right. Why? You are contacting the ball as your swing starts to move left into the follow through. It’s a small difference, but for a gentle fade, it is the little things that count the most. Swinging down the target line of your open stance is crucial to starting your ball on the proper path and having it turn gently back to the landing zone. The good news? You don’t have to think very much about this move. It will occur naturally thanks to the alignment of your stance. Strictly speaking changing up your swing plane is not an imperative. In fact, the swing plane is naturally occurring – most people don’t really think much about it. It happens as a result of their body type and natural inclinations. That said the upright swing plane does tend to produce a fade better than the flat swing plane. To swing the club upright, focus on bringing the club straight back on the backswing so that the shaft is just above your shoulders and parallel to the ground at the top of your swing. This will both add some height to your shots and promote the downswing path that we discussed earlier. Of course, if you have a flatter swing plane, you can still hit a fade – it just isn’t as naturally occurring as it is with the upright backswing. If you are having trouble making these new moves here are a few tips that will help you establish good habits. Teeing the ball low is a good way to gain a little bit of accuracy off the tee. The natural trajectory of the fade trends on the higher side anyway so you are still going to get the height that you want from your tee ball with the bonus of a straighter ball flight. This is also a good way to get a little bit more distance out of your tee shot also. If you tee the ball too high your shots are going to balloon into the air but when you tee it lower your ball will take off with a more piercing trajectory that is sure to add some yards to your swing. Dropping your left foot back a little bit so that your feet are no longer parallel is a good way to naturally force your downswing into the position to hit a fade. If you are ever in a pinch and really need to move the ball from the left to the right this is a nice simple way to make it happen. You can’t really accomplish anything in golf without a good tempo, but it is also one of the areas of the game that players mess up the most. The reason that you need to make sure that your tempo is nice and smooth is because when you allow your hands to get too whippy through the ball you can wind up with big misses. If you pace your tempo properly, your hands will release at the right time and, assuming you maintained the proper downswing path at impact, you will hit that fade. Tempo is simple. Just remember that your backswing should ideally take three times as long as your downswing. Take your time, and allow your clubhead to gradually build momentum so that it reaches maximum velocity at impact. The end result will be an accurate fade that travels a long way. If you want to add the game’s most reliable shot to your repertoire, you know what to do. It doesn’t seem so hard, does it? It really isn’t. Learning how to hit a fade is going to require some practice and patience, but the results are going to be worth it. If you want to hit more fairways and greens, you know what to do. Work hard on that fade for lower scores, and more stress-free rounds.